1. The crickets sing, and I sing with them. 2. Think of me wherever you are. 3. I want to get far away from the stress of daily life. 4. He (NOT Ralph) hugged me so tight that I felt suffocated. He smiled at me and said, "I'll stay here because of you." My heart melted. My eyes were teary and everything was almost blurry. We kissed and then...................................................... I woke up; this was a dream. 5. But as for me, I shall walk in my integrity; Redeem me, and be gracious to me. 6. Dear Confused, I come from Sabah, not Sarawak! 7. And as for the weekend, tonight I'm looking forward to having a nice meal, tomorrow my plans include meeting my brother and Sunday, I want to go shopping! I, too wish i can get away from the stress right now. I am feeling unbelievable stressed out at this very minute..
hahahaha mon.. at least he keeps asking you!! I've dreamt of an unknown person before and told my hubby.. and all he said was "oh, really?" LOL! That was it!! 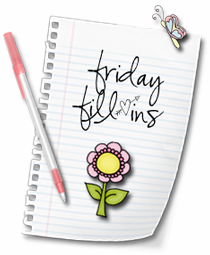 Recent blog:=- Friday Fill-Ins: Smiled, Sabah, Shopping! cist. miss lagi.. watching tv lah Mon! Have a great weekend Mon! hahahah i wouldn't mind if my husband was showed a little jealousy.. but in 6 years.. i am still waiting.. LOL! hahahah tumblr is a blogging website, elai..
i felt like that just now.. but now i'm fine already!! YAY! LOL! yeahh.. that's why.. LOL! luckily they're more educated now abt sabah/sarawak.. last time, back in the early 90s, went to KL and got someone asked my father whether it's our first time to "Malaysia"! Habis my father spoke his mind! LOL! wuaahhh one of your good friends some more!! LOL! so did u eventually tell R who it was? ohh yr hubby! :( :( I wish him a speedy recovery! Take care of yourself too! HUGS! have a great weekend Monica! hope you had a great weekend mon!